I guess that with the new buzzwords today we would call this "cloud service" or mailbox in the cloud. What it is really: a service similar to any big providers like GoDaddy or DomainPeople that hosts a mail server for you and let you create email addresses and mailboxes hosted on their servers. Except I wanted to do it myself and offer this type of service to other people. Well not really... I just wanted to create the service but I don't want any customers. It's just a proof of concept. So my server will host mailboxes and email forwarding services for people who already own a domain name and want to have their MX record point to my server. My server also offers a web page to let users manage their email addresses. Oh, and this is all done on an Amazon EC2 virtual machine. So guaranteed uptime. After you have a functional mysql server that will automatically run after a reboot, you should create a database for the mail config and create a mysql user that has access to it. I'm not sure why, but when adding/removing an entry in the "domain" table, changes don't get picked up instantly by postfix. You don't need to "postfix reload" but it could take a minute or two. Changes to the alias and mailbox tables are reflected right away though. I wanted to provide a way of having different user accounts on the server. Each user owns a different subset of domains that are registered somewhere on some registrar. The users would have set the MX record of their domain to point towards my server. Or they could use my name server and I could setup their MX record but that is a different story. I just need an automated way for the users to add their domain in the list of domains for which postfix accepts email from. I also want users to create their aliases/forwards and mailboxes. This will be done through a web page on which each users will have to login. 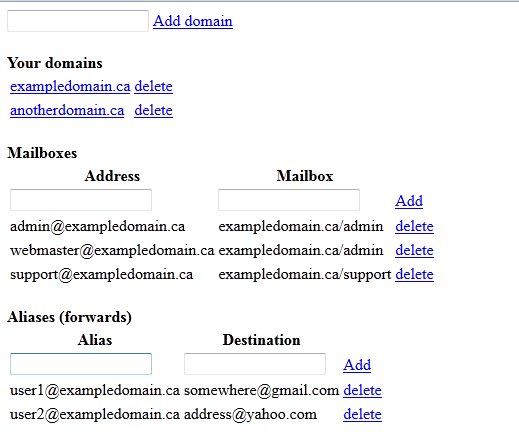 After they are logged on, a list of their domains will appear and they have the choice of adding/remove domains. When they will click on a domain, they will be able to manage their mailboxes and forwards. So all this web application does is to add/remove domains, aliases and mailboxes from the mysql tables that postfix uses. Since the changes are in a mysql server, the changes will be immediately available to postfix, giving instant control to the users on their virtual mail server.